Firmino scored an injury-time winner to secure Liverpool three points in the Champions League opener against PSG at Anfield. After Daniel Sturridge headed Liverpool in front on the half-hour mark, James Milner doubled the host’s lead six minutes later from the spot following a foul on Georginio Wijnaldum. Thomas Meunier pulled one back for the visitors just before the break but Liverpool had a goal from Salah ruled out after it was deemed Sturridge had fouled Alphonse Areola when the pair scrapped for a loose ball. However, the game was turned on it’s head seven minutes from time when Salah carelessly lost possession in his own half. Neymar capitalised on Salah’s mistake and drove the ball forward before Kylian Mbappe cooly fired home to put PSG back on level terms seven minutes from time. Salah was replaced by Xherdan Shaqiri two minutes later. Brazilian ace Firmino saved Liverpool’s blushes by netting a last-gasp goal in the dying seconds. 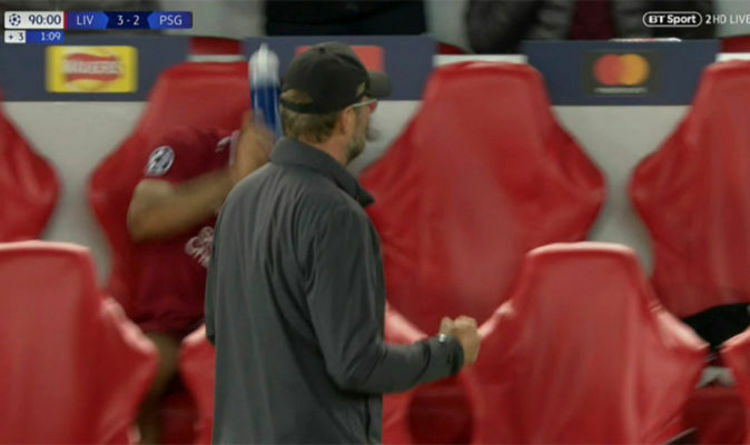 But as the cameras panned to the dugout during the Liverpool celebrations, footage showed Salah throwing a water bottle while sat on the bench. And unsurprisingly, many fans picked up on Salah’s reaction on social media and were quick to share their thoughts. “Why did Salah throw the bottle away…when Firmino scored….is that celebration or frustration,” a fourth supporter wrote. But despite the footage, BT Sport pundit Rio Ferdinand believes Salah was celebrating the late goal. “I hope so,” Ferdinand said when asked if Salah was celebrating.